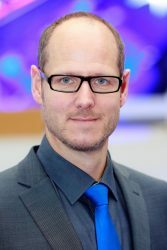 Dr. Rolf Felkel studied mathematics before he joined Fraport in January 2000. He started as a Solution Developer for Landside Systems. From 2001 to 2004 he joined the Project Management group at Fraports ICT department, before led a group of inhouse-ICT- Consultants from 2005 to 2006. In January 2007 he became Senior Manager Landside Systems and in September 2007 he took over the responsibility for the development and support for all airside, terminal and security related IT solutions. Since October 2017 Dr. Felkel is in the position of a Senior Vice President Application Development and Support Services responsible for all IT Applications at Frankfurt Airports ICT department. Rolf Felkel joined the ACI World ACRIS working group from the early beginning in 2009 and became its Vice-Chair in 2010. Since 2017 he acts in the role of the Chairman of ACRIS.